By and large, I am generally disinclined to believe Pew’s / Gallup’s / [insert polling agency here]’s reporting of firearm ownership rates in America. First and foremost, there are some pretty significant flaws in modern polling methods. Second and perhaps more importantly, based on my entirely-anecdotal-but-decades-long experience with the firearm-owning public, the probability of an average firearm owner answering truthfully when a random stranger calls them on the phone or knocks on their door asking if they own firearm is… vanishingly small. However, exclusively for the sake of discussion, I am willing to accept a small part of this 2017 Pew Research Center report on the demographics of firearm ownership. 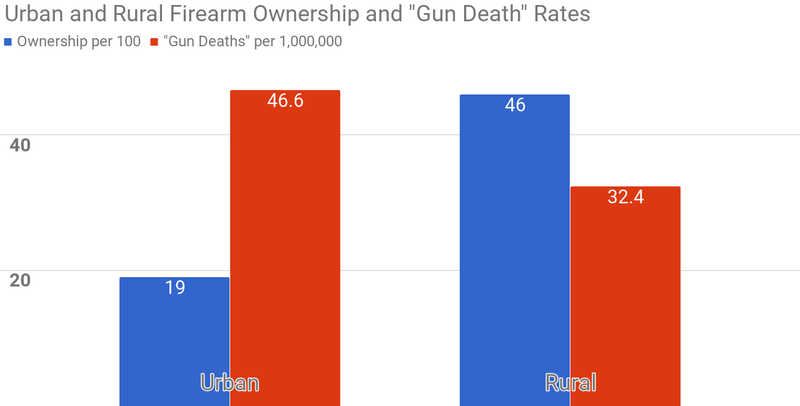 If you read through it, you will see that people who live in rural areas are approximately 2.4x more likely to own a firearm than people who live in urban areas (46% of rural residents reported owning a firearm, versus 19% of urban residents). Given that we are talking about rates, Pew has already normalized for the substantial population differences between the two areas, so if the “gun control” extremists’ hypothesis of “more guns = more ‘gun deaths'” were true (we already know it is not, but bear with me here), one would expect rural areas to have a strictly higher rate of firearm-related fatalities, and probably close to 2.4x higher, right? Please note that that the firearm ownership rate is per 100 people, while the “gun death” rate is per 1,000,000 individuals. This is necessary to have both numbers significantly visible on the chart. Naturally, the firearm-related fatality rates come from the CDC’s WISQARS system, by way of their new “Metro / Non-Metro Indicator”. 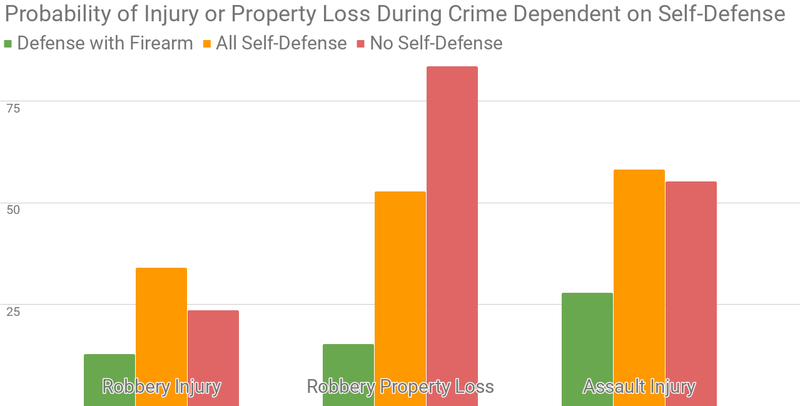 Naturally, there will be some differences as to how WISQARS counts “urban” incidents as compared to Pew’s methods, but even accounting for those slight variations… well, the chart speaks for itself, as I always endeavor to accomplish. You know, if they were not so busy trying to paint hundreds of millions of peaceful Americans as children-hating mass-murderers who deserve to have their Constitutionally-protected rights unjustly stripped from them, I would almost feel bad for the “gun control” extremists. They just cannot seem to catch a break when it comes to the facts of the debate. Before I provide you this year’s update on the data, it has come to my attention that I need to clarify a few things. The hypothesis of “more guns = more deaths” is not my hypothesis, claim, or allegation. In point of fact, it is the underlying, foundational argument of every “gun control” organization in the country, and I am simply accepting it, at face value, for the sake of examining it. I am not setting out to prove any causation. In other words, I am emphatically not making the counter-argument that “more guns = fewer deaths”. Such a claim would require a lot more work and study than I am willing to put into these posts, unlike those aforementioned “gun control” organizations, who are more than willing to perpetuate easily-believable falsehoods in order to line their pockets and unjustly limit your rights. With those caveats made as explicit as I can, it’s time to give y’all the update to last year’s post. 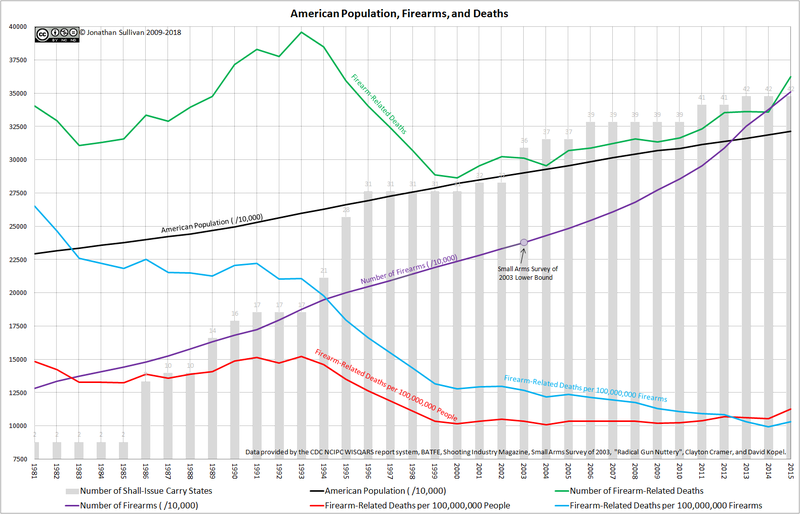 So, with another year’s data under our belt, is the hypothesis of “more guns = more deaths” accurate? There was a surprising uptick in firearm-related fatalities in 2015, but over the course of the 34 years tracked, the trend remains mostly the same. The number of firearms per capita and the number of firearm-related fatalities per capita correlate with a coefficient of -0.74808 – indicating a very strong, but negative, correlation between the two data sets. The number of total firearms and the number of total firearm-related fatalities correlate with a coefficient of -0.17420 – indicating a significantly weaker, but still negative, correlation. As students of statistics remember, correlation does not prove, or even indicate, causation, but correlation is a requirement for causation. 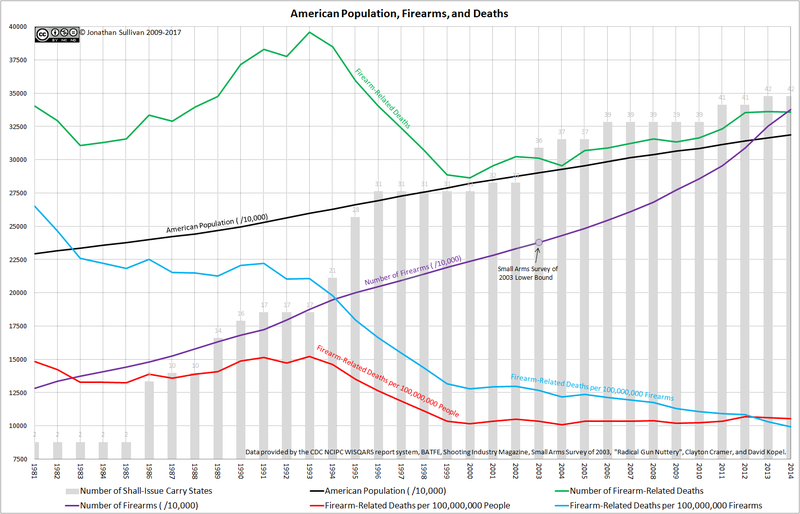 In other words, given that neither the rates nor the raw numbers are positively correlated, then the increase in firearms in the country over time cannot be causing an associated increase in firearm-related deaths. In simpler terms, the hypothesis of “more guns = more deaths” remains false. (The first post in this series, wherein I spell out the above caveats differently, but I thought fairly clearly, is available here. The source Excel spreadsheet from which I generated the above graphic and numbers is available here, should anyone care to check my work. As always, my sources are the CDC’s WISQARS Fatal Injury Reports (for firearm-related deaths and the US population), the Small Arms Survey of 2003 (for a starting point from which to calculate the number of firearms in circulation), the BATFE’s Firearms Commerce in the United States (this time the 2017 edition, and for the number of firearms produced/imported), the Shooting Industry News (for firearm production numbers before 1986), and Radical Gun Nuttery (for the number of shall-issue/Constitutional Carry states in the Union). “More data more better” is pretty much the rule when it comes to statistics, so I try to update the “graphics matter” series every year or so as my various sources update their data sets. I missed a year somewhere in there, but I am happy to bring you the new, improved, examination of whether or not the hypothesis of “more guns = more ‘gun deaths'” holds true. The results… will not surprise regular readers. That is the chart, but what about the actual numbers? The two pertinent rates – the number of firearms per capita versus the number of firearm-related fatalities per capita – correlate with a coefficient of -0.79744, indicating a strong, negative correlation between the two sets of data. 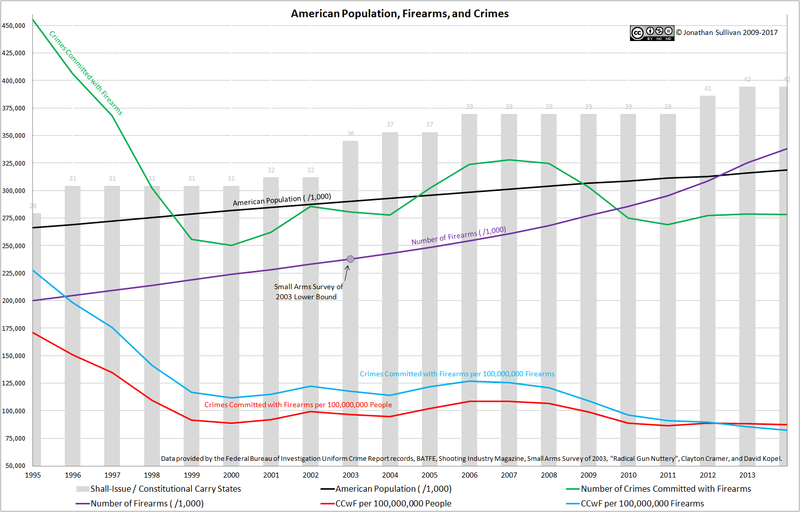 If you look at the raw numbers – the number of firearms, period, versus the number of firearm-related fatalities, or “gun deaths” – they correlate with a coefficient of -0.27315, which remains a negative correlation. As always, correlation does not necessarily indicate, or even come close to proving, causality; but I am also not trying to prove causality. However, the notion of “more guns = more ‘gun deaths'” does try to claim causality, when there is absolutely no positive correlation to support such a causal link. Therefore, the hypothesis of “more guns = more ‘gun deaths'” still cannot be true. According to the United States Census Bureau’s Population Clock, there were 317,474,097 people in America at the end of 2013. Based on polls conducted by CBS News, the General Social Survey, Gallup, ABC News, The Washington Post, and CNN, it seems safe to conclude that at least a third of all Americans own a firearm, or live with someone who does. According to the Federal Bureau of Investigation’s Uniform Crime Reports for 2013, there were 273,044 total violent crimes committed with firearms (8454 murders, 122,266 assaults, and 142,324 robberies). At full size (click to enlarge), the following graphic is 1029 pixels by 1029 pixels, and thus each pixel on it represents 100 firearm-owning Americans. 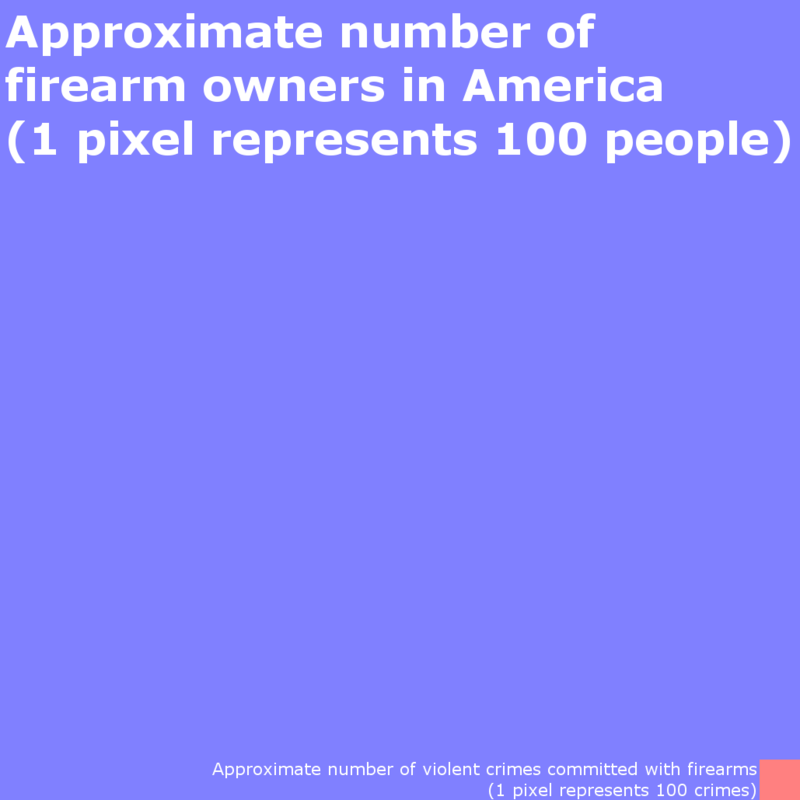 The small, red square in the lower-right corner of the graphic is 52 pixels by 52 pixels, and thus each pixel on it represents 100 violent crimes committed with firearms. 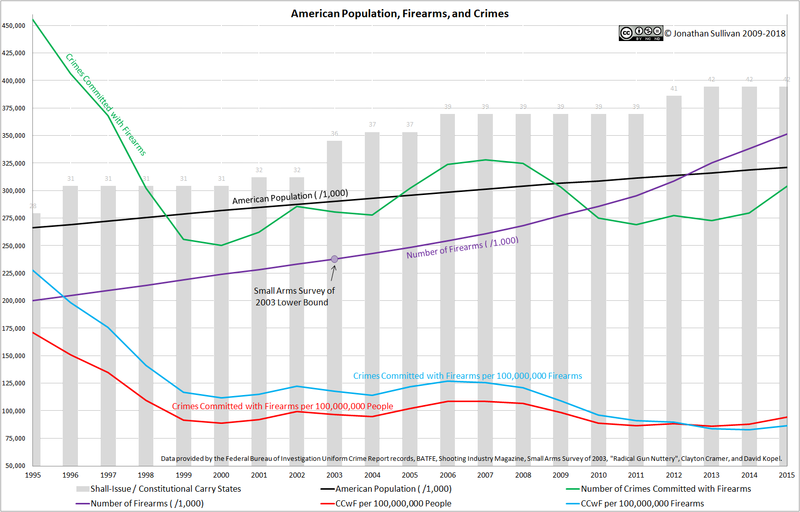 Even if you assume that every single violent crime committed with a firearm is committed by a separate firearm-owning American*, we are talking less than 0.26% of the total firearm-owning population of the country. Yet “gun control” supporters are sanguine with limiting, abrogating, or outright denying rights to the entire blue area, all in the blind, baseless hope that their policies might reduce the size of the red square. Of course, as we already know, that red square is shrinking all on its own despite – or, perhaps, because of – the increased number of firearms in citizens’ hands, the increased number of concealed carry permits, the fact that every state in the union now has some form of carry permit system, the increased prevalence of Constitutional Carry, and all of the other countless ways pro-rights activists have been preserving and protecting Americans’ rights.